Ask fellow campers about "Assateague State Park" and nearby attractions. We again booked a site in the electric loop. Most sites in our loop were large, and were probably about 80' long give or take. Most camp roads and sites are paved. All sites were easy back ins. State park is in a beach area so everything is flat with little shade. Beach is separated by one dune and a 2 or 3 minute walk from your site. Painful sand burrs around on the grassy areas so be careful to use some type of foot ware. Professional and friendly staff, park rangers make routine patrols. Horses make frequent visits. Campground & park great for biking and kayaking. All the bathrooms/showers were open this time for the holiday weekend and we found them much cleaner from my previous review. Spotty signal on our Verizon cell. We will return again! 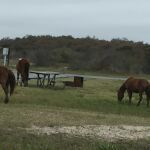 We camped at Assateague State Park in a Travel Trailer. Most sites have no hookups, and some don't allow generators. We were on a no hookup, generator allowed, pet friendly site. They have a dump station and drinking water. It was beautiful! One of the cleanest Campgrounds I've ever seen. The Camp Hosts, Pony Patrol, and all other employees were exceptionally friendly. We saw the wild horses several times a day. The beach is gorgeous and just a short walk from any campsite. We have already booked our next stay in September. We camped at Assateague State Park in a Fifth Wheel. Nice park with mostly dry camping spaces. I didn't appreciate the unadvertised nightly service fee of 6.00. This is not mentioned on their website. I think it is added when making reservations online but we walked in. I didn't see it mentioned on the state site. Right next to the ocean. Take bug spray. 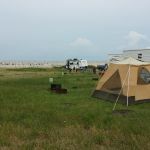 We camped at Assateague State Park in a Travel Trailer. Let me start by saying that I will not hold the park responsible for bad weather (seriously, who would?). That said, loved it. Great bath houses (try an outdoor shower on the back side of the bath house). Nice camp store and concession stand. Good camp hosts, very helpful, stopped by and checked in. Nice touch, movie night for the kids. Would love an electric site next time, but they go fast. Horses stop through the park, prepare for bugs. Never leave without taking in your awning. Dump station, drinking water easily accessible. We camped at Assateague State Park in a Fifth Wheel. Visit the town of Berlin. Nice restaurants. Good walking. Like I said, when you use their shower, try the two enclosed outdoor showers on the back side of the bath house. It's not as glam as those outdoor showers in Hawaii, but pretty nice for a campground. For camping supplies, try Buck's on the way in. Stopped on our way north and were not disappointed. We stayed here 2 years ago and were not impressed with the bath house facilities. They have since replaced the old bath house and have very nice bath houses. A herd of 5 horses visited our site in the evening. Verizon and Verizon hot spot worked well. Easy walk to the beach and to the bay side. We camped at Assateague State Park in a Motorhome. Rate reflects the non-weekend 50% discount for the Maryland Golden Age Pass (age 62+) - which is AVAILABLE FOR OUT-Of-STATE RESIDENTS, too - plus the Reserve America fees. I reviewed this park in 2014, and not much has changed. Beach is just on the other side of the dunes, and is never crowded since the day-use part of the park is well-separated from the campground. It's almost like having a private beach. Interior roads and camping pads are paved, rest of campsite is sand/dirt/grass/weeds. Only one loop has electric and it is usually full in summer. Drinking water is available at the dump station. There is no shade, but temperatures are usually ~5° cooler than inland areas, with a sea breeze, too, but not always. 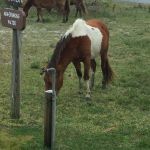 The wild horses wander through the campsites, but are no problem if you follow the rules. As would be expected, there's some horse manure around, and clean-up seems to be done rarely, if at all. Ticks are also present. The bath houses have been modernized since I last reviewed the park. Showers are a little cramped, but with plenty of hot water and good pressure. They are cleaned daily, but with heavy use they can be a bit sandy. No WiFi, except at Camp Store/Snack Bar, but I did OK with my cell phone hot spot via AT&T. This is a great park if you value proximity to the beach, as I do, but some may not care for its lack of shade or modern amenities. We camped at Assateague State Park in a Motorhome. Some pretty good restaurants about 6 miles back on Route 611 towards Route 50: the Decatur Diner, an old style diner that's excellent for breakfast; and just a little further down the road, Smoker's Barbecue Pit, which has great food (pulled pork & potato salad are personal favorites) for takeout or dining in a screened-in seating area (no A/C). We had a site in the electric loop. Our hookups we in good working order, our site was huge and noticed most others the same. Interior roads and sites were asphalt. Typical beach area camping, place flat with little shade. Campsites are easy walking to the beach. Some of the new bathhouses were not yet finished and found the open bathhouses were not kept clean. Professional and friendly staff, park rangers make routine patrols. Horses make frequent visits. Campground & park great for biking and kayaking. We will return again! 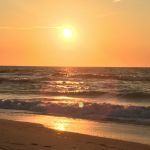 We camped at Assateague State Park in a Travel Trailer. Sites are paved asphalt and generally level, surrounded by grassy sand with many prickly pear cactus mixed in. No trees, very open layout. Very windy while we were there, and the open layout did nothing to slow down the winds. Only one loop has electric, and we were not in that loop. A pack of wild horses made a daily visit to the campground. The major downside: ticks. They were everywhere. We had to remove several from our bodies each day, and even found them after we returned home. We camped at Assateague State Park in a Fifth Wheel. Only a ten minute ride from Ocean City. Lots of seafood (especially crab) restaurants in the area, even on the road into the park area. Where else could you go and see the wild ponies and have the Atlantic Ocean as the backdrop. We go here every year and we are impressed with the uniqueness and beauty every time. These ponies walk around the campsites and on the beach. There is only the day beach store and cafe with a small gift shop...The bike path is paved and level. They are re-doing all the bath houses as they are old and moldy. The Maryland Park police ride through frequently and there are camp host people assigned to every loop. We camped at Assateague State Park in a Motorhome. Bring your camera to take pictures of the wild ponies! We stayed during there opening weekend in the electric loop. Widely spaced sites with good paved pads. The electric service was strong. Yes, the ponies do walk through the sites several times a day and were wonderful to watch. We would have rated the campground higher but the restrooms are dated and filled with sand and the park wasn't busy yet. Can only imagine how dirty they would be in season. Loved bike riding over to the National Park visitors center on the bridge. Beautiful views! Also biked down to the National Park and went on the nature trails. It was well worth the trip. The check-in folks were helpful and friendly. The park was patrolled several times a day by rangers. We want to bring our kayaks when it is warmer since it was very cold and windy while we stayed there. Hope to return next year. We camped at Assateague State Park in a Motorhome. Beautiful, natural setting. Check in was quick although the staff member checking us in was a bit short with us and not very friendly. Stayed in B loop right across from the entrance to the beach. Only one loop has electric. Level asphalt pad on our site. Check for pad size before booking because there is a large variance in size from site to site. Bath houses were modern and clean. Camp store was fairly well stocked, especially considering it was late in the season. Paved paths for walking and bicycling. No lifeguards on the beaches other than the area at the ranger station. Would definitely return. We camped at Assateague State Park in a Motorhome. This park is all about the beach. It goes on for miles, and you mostly can't even see the bath houses or other low buildings on the other side of the dune line. Stayed for 2 days midweek, and you could easily have no one near you on the beach. Might be more crowded on weekends. I didn't down rate the park for what it doesn't have, but it could matter to some. Only one loop has electricity, and it fills up fast so reservations are advised. No water at campsites, but it's available at the dump station. There is no shade, and when the temperature hit 95, the A/C didn't keep our coach that cool. The bath houses were OK, perhaps a bit overused while some are closed for renovation. Staff was friendly and efficient. We camped at Assateague State Park in a Motorhome. Our family doesn't necessarily value the amenities others do; we prefer to feel as if we are off the grid as much as possible. We were thrilled to find the park allowing campers to use the loops previously closed due to renovations and we took advantage of being able to make a last minute reservation. We didn't mind that the bath house on our loop was closed and stayed with no power or water. We had the loop almost to ourselves except for the horses and a buck deer. The beach was pristine and a little 3 day old "paint" foal wandered near. Although no one can guarantee seeing them, we saw the horses each day without having to search long, if at all. They were in F, G, H and I loops each day. The beach is quite windy with sharp shell shards at waters edge so bring water shoes to protect little feet. The water was still quite chilly this early but it was perfect to enjoy a book at waters edge in shorts and a sweatshirt. Groceries and gas are nearby and check-in was efficient and rangers friendly. Bath house was clean and surprisingly uncrowded even with E&F loops' closed. We weren't overly troubled by flies, mosquitoes or the mountains of manure others complained of. But, it was still quite cool for the season. If you are looking to have an excuse to unplug, relax and beach it, this is the perfect park! 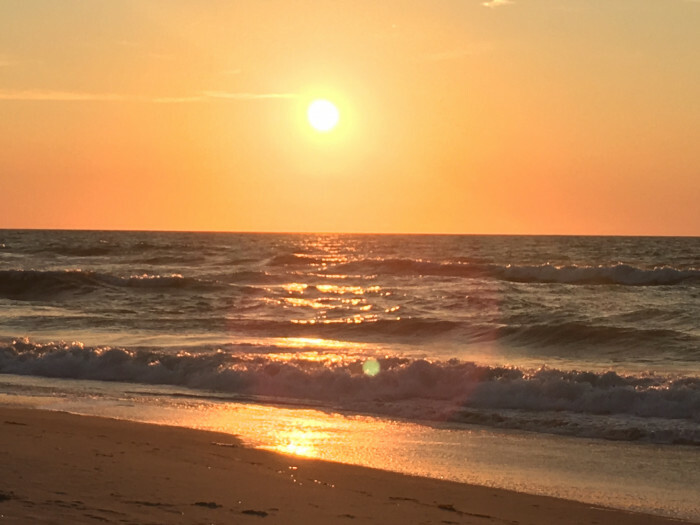 If your family needs more to do to be entertained, stay in the southern Chincoteague area because they aren't connected by a road and going in between means an hour by car. We all wish we could have stayed longer. We camped at Assateague State Park in a Motorhome. This park continues to be a big hit. There are very few places where you can camp on the dunes so close to a pristine beach. The bathrooms are clean and the rangers are nice. We have camped here this year for two weeks total spread out over two visits. We brought a boat with us. The launch facilities are on the mainland right next to the bridge to the island. The thing you have to remember about the horses is that they are wild animals and unpredictable. People forget that and treat them as if they are domestic animals. They can bite, kick and most importantly- you have to keep your food locked away in a car or RV. I have personally witnesses them walk through tents to get after food and tear apart coolers. That being said, this is a great place and difficult to get reservations. We camped at Assateague State Park in a Motorhome. Are you affiliated with Assateague State Park ?